The Giant’s Causeway filly, Emotif, returns to racing in Thursday night’s Listed UAE 1000 Guineas over 1600m at Meydan and Sheikh Mohammed bin Khalifa Al Maktoum’s runner will be the focus of many a racing enthusiast following her runaway debut win in South Africa last May. Trainer Mike de Kock has made no secret of the fact that Emotif is highly regarded by the yard and he said on Tuesday: “Emotif is a very smart filly and we think a helluva lot of her. 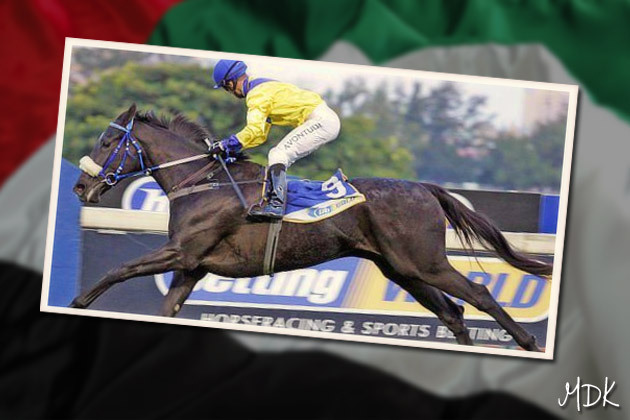 She had a problem when she arrived in Dubai after travelling from South Africa, suffering from azuturia or ‘tying up’, which kept her out of training for a while. We’ve done as much as we can do with her though, she’s showing us a lot and we’re expecting her to be a huge runner.” Christophe Soumillon will take the ride on Emotif in this $US250,000 event. Jardim (Christophe Soumillon), has been disappointing so far this season, but he will be having his third run following a rest in a handicap over 2000m on the all-weather. “We’re hoping for a better run,” said Mike. Mohammed Khaleel’s Star Empire was beaten only a quarter-of-a-length over 2410m on his return to the track after a two year layoff recently and he is in good shape for a 2810m handicap this time round. “He’s fitter than last time and we’re happy with his preparation,” said De Kock. Both Royal Ridge and Jet Legend are expected to be suited to the Tapeta surface in Race 7 over 1600m. Royal Ridge (Paul Hanagan) is preferred, but his stablemate is also expected to have a say, as both are working well.